Eutelsat Communications (Euronext Paris: ETL) and SigFox Foundation have announced a partnership at AfricaCom 2017 on the "Now Rhinos Speak" project for the protection of the endangered rhinoceros population. Prior to making this partnership official, Eutelsat and Sigfox Foundation have collaborated since November 2016 on an initial operation in southern Africa connecting approximately ten animals. Three base stations of Sigfox’s low-speed IoT network have been connected to the secure platform using Eutelsat’s smartLNB satellite service that extends terrestrial IoT networks anywhere. The collaboration improved the identification of areas of surveillance and refined allocation of resources for protection on the ground. This first step will be followed by a monitoring solution for game parks, using sensors that can give a voice to the territory and detect unauthorized intrusions. 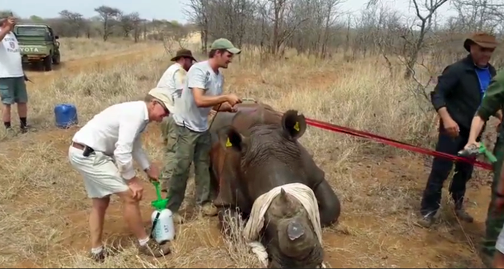 A team of ten developers-engineers are working closely with a rhinoceros conservation committee in Africa to this end. Marion Moreau, President of the Sigfox Foundation, reported that the partnership agreed between Eutelsat and the Sigfox Foundation for the protection of rhinos is an invaluable opportunity to gain a better understanding of an endangered species and be part of the effort to protect them.Thanks to the support of Eutelsat, Sigfox can give rhinos a voice every day, wherever they are. Nicolas Baravalle, Director of the Sub-Saharan Africa region at Eutelsat, stated that the company is proud to support the Sigfox Foundation in this critical project for the protection of endangered species in Africa. Through this partnership, the use of satellite capacity really comes into its own, enabling us to connect remote points in an environment that will never be served by terrestrial networks.